Tamera is the welcome and friendly face you will see when you arrive at Ritz Med Spa, or when you call to make an appointment. She has been in the medical esthetics industry for over 19 years and has a vast knowledge of the anti-aging services and products available in this industry. In addition, her solid experience in the healthcare environment results in the ability to deal successfully with the demands of a busy and diverse patient base. 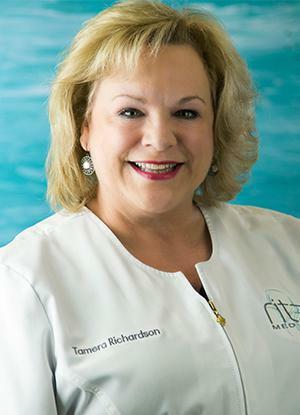 Tamera enjoys greeting and registering patients, and discussing the variety of med spa offerings you may be interested in. Our patients always comment on how much they enjoy her friendly and outgoing personality!